I love you Mom but no. No egg cozies today. They’re not exactly as beautiful or complicated as decorated Easter eggs from Eastern European traditions. Just a few adorable, non-traditionally colored oeufes for your visual pleasure – a perfect use for small amounts of leftover yarn. 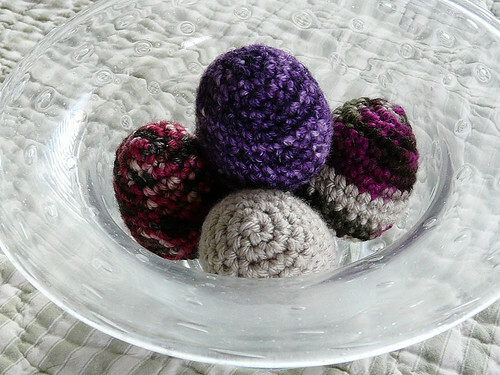 I’ll make a few more because Mom had a good idea: share the eggs with a nearby nursery school once they’ve served their intended purpose as Sunday centerpiece. Now that, my dear mother, is using your head. 6 comments to She’s a funny one. Oh, those are so stinkin’ cute! and I’m LOL at your mom’s comment! They’re gorgeous! I think I might need to make one filled with catnip for my little furry baby girl :). These are great — and I think you should fill a couple with catnip for Rocky and Nikita!! LOL! They are adorable. I can see they would be excellent cat toys, too. She’s funny, and I think a practical thinker. I love your eggs, because they are not “easterly” at all. Love these! And it’s a great idea to donate when you’re done with them.